Cate West: The Vanishing Files is rated 3.1 out of 5 by 14. Rated 5 out of 5 by LuvBFG56 from Excellent story line and characters Love Cate, she has a believable persona and Ben well, he is just dreamy to look at....as well as his other partner...hehe! I played the sequel 1st and wish I would have gotten this one 1st, but thats the way sales go.... The game play is repititious and the HO;s can be hard to find, but to me the story and characters more than make up for it so I will not give less than five stars. The music is relaxing and there are very brief voice-overs, I think they could have had complete voice instead of written dialogue, but that is just now beginning to get good in the newest games. I really hope to see more Cate West....I have played many female lead HOG's, she is by far my favorite....dev's please keep them coming....but for gosh sakes, give the poor girl a new outfit next time...she wore the same one in both games...geeeesh! Gamers, if you can catch both this and Velvet Keys on sale....I'd grab them up! Rated 4 out of 5 by arnold1049 from GREAT PLOT AND CLIFF HANGER ENDING I played the demo and then immediately used a coupon to purchase the whole game because I wanted to see the end of the story. This is a great HOG with a great storyline that ends with a cliff hanger that continues into the next game in the series. At least that is what I am guessing, not yet having played the second game. Cate West has psychic powers that she starts using to help solve a series of crimes. The crimes are masterminded by a character called "M" and seems to have something to do with the death of Cate's dad. The game consists of 15 chapters with 5 parts to each chapter. The first part is a set of HOS containing 10 items to find in each location. Part 2 is a set of fragmented HOS that show clues necessary to solve the current crime. The 3rd part is a find-the-differences game. Part 4 requires you to "arrest" the perpetrator, based on the clues. The final part is another find-the-difference game that convicts the perpetrator. I did not play with sound or music so cannot comment on the voiceovers. The graphics were great. I think that the choices you make during play influences the outcome of the game. When I finished it, I got a message that I had finished the game in the "best" manner. The only reason I didn't give it 5 stars is because the HOS repeated over and over again. This repetition got a little annoying, but did not help a lot in making the items easier to find. I used a lot of hints. Rated 4 out of 5 by rosekaufmann from PUT THE THUG BEHIND BARS Cate has visions from seeing and touching articles. She is aiding the police in solving a variety of crimes – pick out the culprit and put the thug behind bars. From the clues discovered during the investigations, you eliminate the innocent people from the suspect pool until left with the guilty party. The process for each crime is the same, so if you reached the point in the demo where you identify the guilty and liked it, you will like the remainder of the game. A nice blend of different puzzles and HOS. There are spot-the-differences, put articles back where they belong, traditional HOS and find fragments for each case you investigate. The dialogue is written but what little voice acting there is, it's overdone. Artwork is quite detailed but some parts of the HOS are crowded, and music is okay (not too sleepy and not too peppy). The fact that each case stands alone leaves a handy break point, so you can start fresh when you come back. Relaxing game – no sense of urgency as in some games. Rather lengthy as you have a few crimes to solve. Rated 4 out of 5 by LoneCleric from A well-rounded HOG I've given this game 4/5 on pretty much everything, and that's really how I feel about it. It's not quite perfect in any way, but the overall result is quite enjoyable. Gameplay-wise, the game is broken down into chapters, and each chapter follows a strict routine. Part 1 works like a traditional HOG, where you need to find N objects total, spread across M different scenes. Part 2 is a bit similar, except that now you're looking for broken pieces of a given object (one object per scene, with pieces being duplicated). Part 3 has you finding the differences between two photographs. Part 4 is the most original of the lot - you have to pinpoint a suspect based on a series of cryptic clues. Finally, in Part 5 you need to compare two copies of a scene, placing objects back where they're missing. As for the plot, it has a couple holes (either that, or the story happens in some parallel universe where psychic powers are commonly accepted), but remains quite interesting to follow. Rated 4 out of 5 by nancyt2u from Cate West is a challenge This is a HOG with some fun twists. Objects are either really easy of somewhat hard to find. There are the type of mini games that I enjoy mixed in with the HOG. Story line is not hard to follow. I don't listen to any games so I can't comment on sound effects, music or dialog. I haven't finished but I can say it has kept me occupied for a while. It is easy to leave and come back to because there's nothing to backtrack on or try and remember from other levels. A good bang for the buck. Rated 3 out of 5 by pennmom36 from Cate West: The Vanishing Files Cate West is a novelist who has the gift of visions simply by touching items. The city has a bunch of unexplained cases dubbed The Vanishing Files and Cate West is the man (woman) for the job. You need to find hidden objects that are on your list and weed out the innocent people until you find the guilty party. 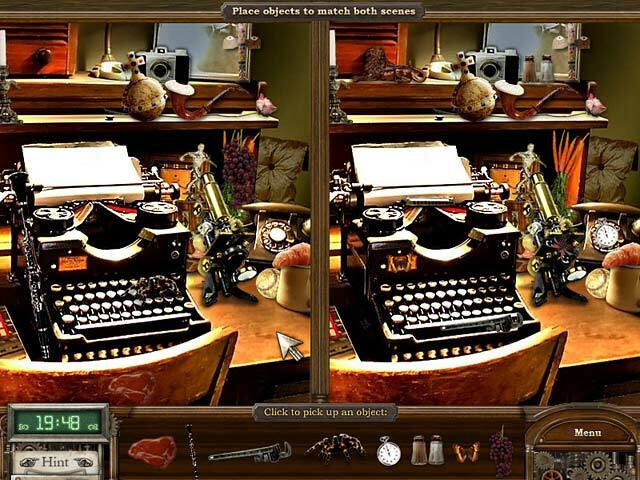 There are mini games such as spot the difference as well. No voiceovers so you need to do a lot of reading other than that it's a nice deductive hidden object who dun it game, enjoy! Rated 3 out of 5 by delkon from Keeps repeating! This game really has 5 types of games within each "case" you have to solve: 1. 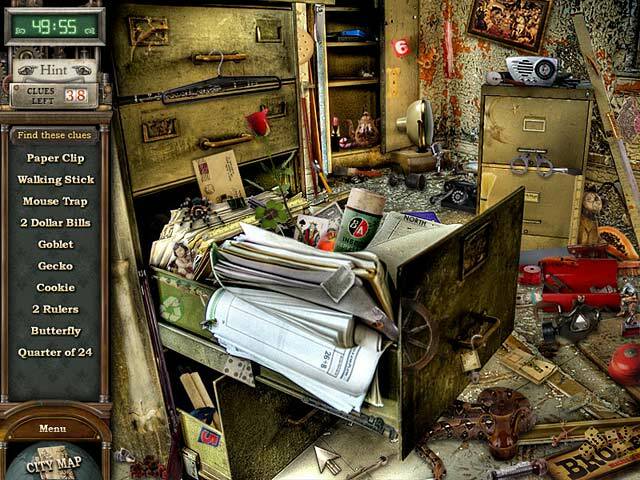 Hidden object game: Each "case" has a certain number of hidden object scenes to complete. These are a pain because the graphics aren't that good and sometimes junk is just piled on top of other junk to make your eyes hurt just trying to find the item you are looking for and there are no new scenes after a while. Just the same scenes but you are looking for different things. I hate Hidden Object games like this one is. Oh, and if you click a few times without finding an object, you get points taken away. 2. Find the differences: If I wanted a Find the Differences game, that's what I would've paid for. I really hate these and sometimes the difference is so minor, you hurt your eyes trying to see it, even after the "hint" narrows the area down by a fourth of the entire scene. Hate these immensely. 3. Find the pieces! This is the easiest game, in my opinion. You have an item that is seperated into pieces and strewn about a scene and you click on all the pieces of the object you can see, and then you have to click the hint because they bury at least one piece so well that you will not find it on your own. 4. Who's Guilty? 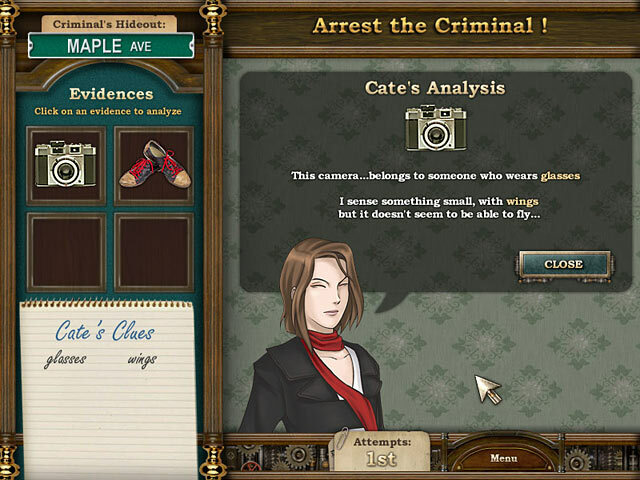 In this game, Cate touches each of the objects you just spent time looking for pieces of to give you hints about who the guilty suspect is out of a field of suspects to choose from. Most of the time, the suspect that fits all the hints isn't the guilty party, so you lose points then as well. 5. Match the scenes. You have to look at two identical scenes and then put objects back into one image or the other so that they both match. Monotonous and time-consuming and doesn't really make sense why this ties up the case against the guilty party. You do this 15 times in a row and towards the end, the only thing that keeps you going is that you get the big reveal of who the bad guy is which I figured out before they even got to it. All in all, I don't recommend this game to Hidden Object Gamers because you will not enjoy it. I know I didn't and I wish I hadn't wasted money on it. 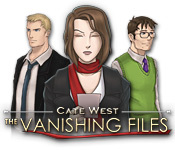 Rated 3 out of 5 by animefan18 from Cate West: The Vanishing Files This game is fun but repetitive. I give it 6 out of 10, a detective story with biblical elements. Rated 3 out of 5 by neilskinut from I just got boored Just was not that much fun for me. Not that hard of a game just got tired of finding easy clues. Too many great games out there. Rated 3 out of 5 by mspaws from didnt like the voice overs I just could not finish this game. I did not like the characters saying one word and you finished reading the script. Would have been alot better to not have voices at all. Too many spot the differences and deducted waaaaaaay to many points for misclicking! I dont know what the points have to do with the game, but deducting points takes the fun out of the game.